Most of the books that I have worked on have been narrative non-fiction. I’m starting to do more work with fiction now and it is a lot of fun. One genre I never really expected to be representing is photography books. 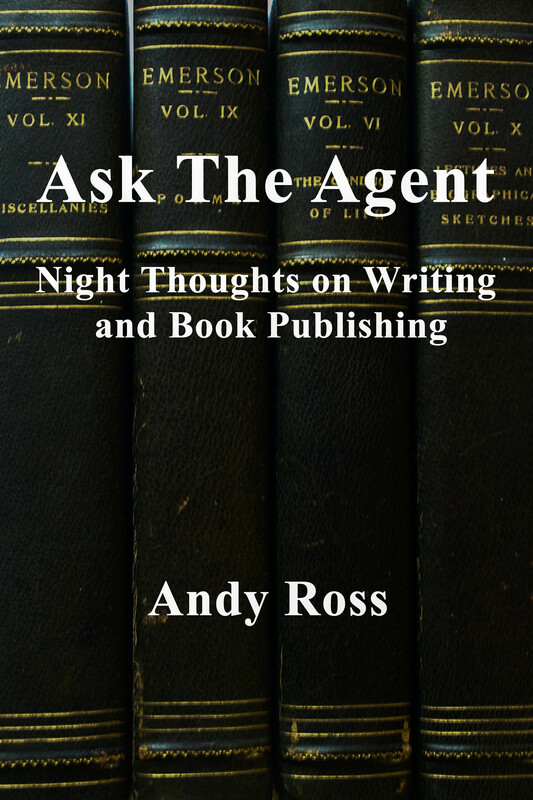 But I have said many times before that my life as an agent is full of surprises. 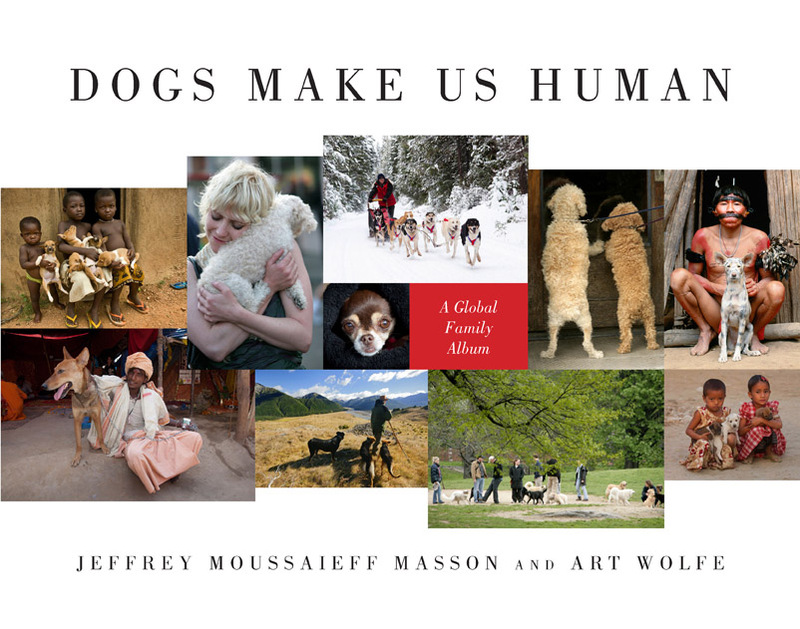 This week, Bloomsbury USA published Dogs Make Us Human: A Global Family Album with text by Jeffrey Masson and photographs by Art Wolfe. It is a gorgeous photographic book filled with pictures of dogs and their human companions in work and play throughout the world. We wanted to avoid the usually cutesy-wutsy doggie pictures. There are enough of those kinds of books already. So we used as our inspiration the classic and enduring photographic book, The Family of Man by Edward Steichen. We wanted to do a kind of “family of man and dog”. After all, Jeff Masson has been saying for years that the bond between dogs and humans is unique, the only love bond that is truly cross-species. And it appears to be a bond that is universal to the human experience worldwide. Art Wolfe is one of the world’s great wildlife photographers. He has worked on every continent. He has done numerous spreads in National Geographic. He has been photographing dogs for years and his work has finally found a home in this book. You see dogs with Asian boat people, dogs with children in African villages, dogs herding sheep in New Zealand. Oh, and my favorite. A stone age Yanomami warrior and his dog, both dressed up in war paint. There were some challenges in putting together this project. Art’s agent and my friend, Peter Beren, approached me about doing this book and having my client, Jeffrey Masson, write the text. Some of the challenges were geographic. Jeff lives in Auckland New Zealand. Art lives in Seattle but is usually on shoots in places inaccessible. Most of the time that we were putting this deal together, Art was in Antarctica. (Probably not photographing dogs down there, though.) Nancy Miller of Bloomsbury, who is one of my favorite editors, fell in love with the idea. Bloomsbury did a magnificent production job. They made the book a lead title for the Christmas season and graced the cover of their catalogue with Art’s images. Here is a great slide show of some of Art’s pictures with commentary by Jeff and Art. Dogs Make Us Human from Art Wolfe on Vimeo. Jeffrey Moussaieff Masson first gained attention as projects director at the Freud Archives. Jeffrey’s research led him to the conclusion that Freud erred in turning away from his insight that human misery was fueled by childhood sexual abuse. Masson speculated that Freud gave in to peer pressure rather than acknowledge a truth that would have harmed his career. Jeff accused the psychoanalytic establishment of covering this up for decades. For such heresy, he was excommunicated from the psychoanalytic profession and treated to numerous public burnings by its members. Since then, Jeff’s insights have become conventional wisdom in psychotherapeutic circles. In spite of some important contributions to our understanding of the human psyche, Freud has been discredited for his therapeutic ideas in no small account because of Jeff’s work. And Freud’s thought has been relegated primarily to the intellectual dustbin of literary critical theory. For the last 20 years, Jeff has turned his formidable intellect to the study of emotions in animals and in animal rights. 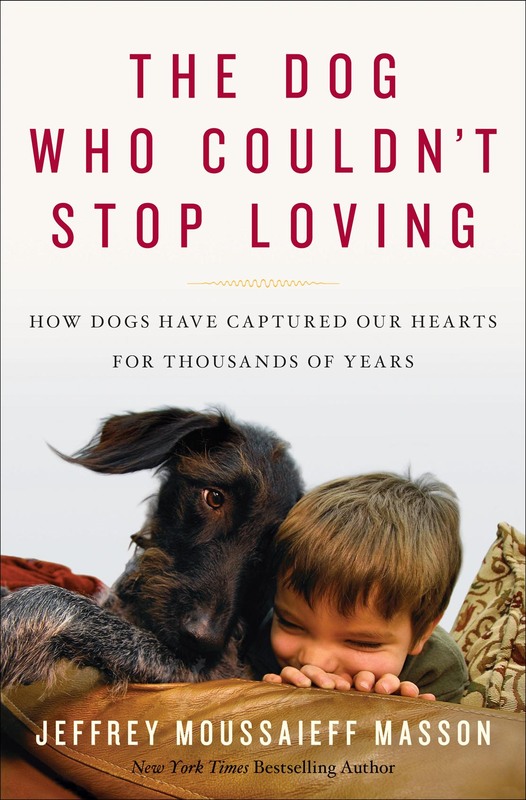 His newest book on this subject: The Dog Who Couldn’t Stop Loving: How Dogs Have Captured Our Hearts for Thousands of Years, has just been released. Today Jeff and I are going to talk about this very special human-animal bond. Andy: We are in the same family as the great apes. We share 98% of our DNA with them. We are not remotely related to dogs. So how can you claim we are more like them than like chimps, for example? Jeff: We may resemble primates physically, but when it comes to certain emotions, I think we have more in common with dogs than with the great apes. The ability to reach out to other species, for example, is pretty much unique to humans and dogs. Andy: Why are we so attached to dogs, and so much less attached to, say, pigs or cows or sheep? Jeff: Partly because we can read their emotions so easily. We know when we do something they like. How do you know if a cow finds you loveable? Dogs tell us. They rarely have a reason to fear us. Pigs, cows, and sheep are simply food for us. That is why I am a vegan! Andy: You say dogs are the only animal who has benefitted from domestication by humans. What about cats, though? We don’t eat cats or otherwise exploit them. And they, too, seem to have chosen us. So what is the difference? Jeff: The difference is that in spite of domestication cats have not changed their nature to the extent that dogs have. Dogs want to spend all their time with us, cats only occasionally. If they decide we are doing something they don’t like, they simply walk away. Dogs try to find a way to interest us. They are obsessed with us in a way that cats rarely are. Andy: How old do you think the connection with dogs is? Jeff: Well, this is a hotly debated point at the moment. I am no geneticist, so I can only answer in terms of what seems reasonable in the many conflicting accounts I have read. The range is very wide: from 15,000 years, to 125,000 years. Most scholars seem to think that somewhere in the middle, around 40,000 is a good compromise. I would agree. But the important point is that dogs have been with us longer than any other domesticate, animal or plant! Andy: Do you believe that barks are an attempt to communicate with us? Jeff: I do. And I believe in the next ten or twenty years we will have deciphered their meaning. There is already work on this. Andy: Are pit bulls different? Jeff: Different than other dogs you mean? In their aggression? I have not lived with a pit bull, but when I see them on the street, I am always a tiny bit nervous. When I tried to analyze why, I realized that I was nervous of the “owner”, not the dog! Dogs pretty much give us what we want. If we want them to be sweet and gentle, they generally are. If we want them to terrify our neighbor, they do. But it does seem true that pit bulls have been bred to feel no pain and to fight. I would not recommend them to a family with small children, but, you know, my ignorance is beginning to show here! Andy: Do dogs display temperament differences from birth? Jeff: They do. Whether that can be changed completely over time through socialization is an open question. I tend to think it can. Andy: Are some dogs “naturally” aggressive? Jeff: They can be bred that way. Are humans naturally aggressive? We can certainly become that way. But I don’t believe that a dog raised in a happy gentle home from birth will remain aggressive even if born with that temperament. I could be wrong! Andy: Do dogs have any kind of moral system or ethical beliefs? Jeff: Yes, I would say they do. They have codes of honor; you can see it when they play. You do not attack a dog who has submitted for example. Andy: Do you believe dogs have any sense of death? Jeff: Yes. Think of dogs in a shelter waiting to be euthanized (if not adopted). They seem to know that you are their last best chance. Also, they definitely get depressed (or if that word is too strong, deeply sad) when a companion, human or otherwise, dies. Andy: Why are some dogs able to attach to just about any species, not just humans and other dogs? Does any other animal do this in the wild? How about domesticated animals? Jeff: That question is at the heart of my new book. I think humans and dogs are the only two animals who consistently make friends across the species barrier, and I wonder if this is merely a coincidence, or if this is something we have taught each other? I think the latter. We reinforce a certain tendency in one another until it becomes a trait. So it is an example of mutual domestication. Other domesticated animals only rarely exhibit this gift. Cats, from time to time, but not reliably and consistently, the way dogs do. Andy: Do dogs have any moral qualities we lack? Jeff: Yes, dogs have a greater sense of friendship than we do. They are also able to enjoy life in daily events to a greater extent than humans: their joie de vivre is unmatched. They attach for life: have you ever heard of a dog divorcing his human companion? As for loyalty, well, I rest my case. I do feel that in the future we will learn about some emotions dogs have that are beyond humans. Andy: Do you believe dogs can be exploited? Jeff: Yes, and it is one of the saddest things to see an animal who wants nothing but love treated with cruelty. Without believing in an afterlife, I believe there is a special place in hell reserved for humans who do this. Andy: Have you ever met a dog you did not like? Jeff: Yes, but usually I look up from the leash and see the source. Andy: Is our relationship with dogs unique? Jeff: So much so, that I would argue that dogs make us who we are. We are human in the way we are human because dogs have been our companions for thousands of years. We would be a totally different species without them. I cannot imagine life without dogs. Andy: Have dogs taught us to love? During the last 20 years, Jeff has turned his formidable intelligence to the study of emotions in animals and in advocating animal rights. His newest book: The Face on Your Plate: The Truth about Food was published by W.W. Norton this past spring. Jeff lives on the ocean in New Zealand (aka paradise). Check out Jeff’s website. Andy: Jeff, I want to talk about Freud in this interview. It seems that the people who remember your critique of Freud don’t know much about your work on animal emotions. And those who are your current readers can’t remember what you did with Freud. Let’s go back and talk about your revision of Freud. I have to say that I read part of your book and all of the reviews. As a layman, the dispute seemed sort of like medieval hair splitting. Why was your discovery so important and why did it enrage the entire Psychoanalytic profession? Jeff: It was hardly a trivial point. I was maintaining that fantasy did not create neurosis, only reality has that power. This was not simply my opinion, but was supported by historical documents of which analysts preferred to remain ignorant. If I was right, then they had been unfair (verging on malpractice) to female patients who told them they were abused only to be assured it was merely a fantasy. Andy: Some people think that your work was the beginning of the end of the Freudian dominion of Psychoanalysis. I know you are a modest person, but can you claim some credit here? Most psychotherapists aren’t Freudians any more, right. Hasn’t Freud primarily been relegated to literary theory and intellectual history? Jeff: It was not my work, but the documents themselves. After all, you could not simply wish away letters by Freud that had been deliberately removed from the public record. I put them back, and when people began to become aware of the implications, Freud’s reputation suffered as did that of subsequent analysts. Eventually analysts recognized the damage that was being done by their “denial” and they switched camps. But it was a bit late in the game. Feminists like Florence Rush and Judith Herman and several others had been saying the same thing I did for years. Once these new letters came to light, it gave true gravity to their views. That said, I abhor the term “Freud basher” so often thoughtlessly applied to me. While I have fundamental criticisms, I also acknowledge that Freud did indeed have many fascinating insights into human nature and he could write far better than perhaps any other psychologist before or since. No mean achievement! Andy: But you moved on from there too. You went from being a psychoanalytic heretic to being a very eloquent (if sometimes provocative) critic of the entire psychotherapeutic enterprise. And you have expressed no less withering contempt for psychopharmacology. It there nowhere left to turn in the Massonian Universe to restore one’s mental health? Jeff: Yes, I did take a look at other therapies, and was even less impressed with them than with Freudian therapy. I still maintain, after all these years, that the best shrink is a dog. I really mean that too, as you know! Andy: Whenever we talk about intellectual history, it seems that you still maintain an admiration for Freud as a thinker who contributed immeasurably to our understanding of ourselves. Can you explain your (seemingly) contradictory feelings about Freud? What is your assessment of his contribution? Jeff: I answered this partially above, but let me add that I am writing the new introduction to the Sterling Illustrated Edition of Freud’s The Interpretation of Dreams. I believe that among his great achievements was: the recognition of the importance of childhood for later human unhappiness (or trauma if you prefer); the mechanisms of defense, especially denial, repression, and counter-phobia – a marvelous idea when you think about: we become mountain climbers because we fear heights! ; the unconscious; the importance of sexuality; the primacy of dreams; the reality of internal suffering. I could go on and on. But I never am given the chance any longer! Andy: In the early 90’s, you moved in an entirely new direction. You started writing about the emotions of animals. Your first book, When Elephants Weep, was an international best seller. What led you to this fascination with animal emotions? Jeff: I was disappointed with human emotions and wanted to study those of another species. Was it possible that other animals felt more deeply than we do, or even felt different emotions? It is an ever-fascinating question. I did not answer, but I attempted to, and this resonated with the public. People who lived with animals generally knew they had profound feelings, and liked seeing this view vindicated. Andy: And that was followed by Dogs never Lie About Love, a book that sold over 1,000,000 copies worldwide. It really changed the way people thought about emotions in dogs. Jeff: Yes, nowhere is it more obvious that we take second place when it comes to the ability to love freely, deeply, unconditionally, than with dogs. They are undoubtedly our superior in realms like friendship, loyalty, depth and ease of affection, and so on. Again, I was not saying anything unknown to dog lovers over the centuries. Andy: You are back to dogs again, too, aren’t you? You have a new book about love between humans and dogs scheduled for release next year. Can you tell us something about this? You must know that dog books are a cottage industry. But I think that, against the odds, you actually have some important and original to say. Jeff: I hope so. I maintain that we have become the species we are only because we co-evolved with dogs. Dogs have been with us longer than any other animal, by far. We go back at least 40,000 years and perhaps longer. So there was time for us to grow in tandem, and I believe we did, which is why we are the only two species who make friends so easily across the species barrier. I don’t think we would be the species we are without dogs.